Today is World Gin Day, a day when people from all over the world come together to share their love of a Juniper-flavoured spirit [OK, I may have over-sold this event]. A fair few of these people will be taking their gin as a Gin and Tonic, with the quinine-flavoured sparkly water contrasting with the botanicals from the gin. The tonic of choice over the last few years has been made the up-market Fevertree tonic, both either it’s original Indian Tonic Water form or the more floral Mediterranean Tonic Water. It’s fair to say that this maker of premium tonic waters has been one of the major beneficiaries of the recent gin Tsunami. I, like many gin-drinkers, regularly curse the fact we didn’t invest in the share IPO as much as we have in their products. The first listed in November 2014 at an IPO price of 134p per share and currently trade around the £30 mark. This financial pain aside, I must admit that Fever-tree tonics add something to most Gins and are a way better product that the rather dull Schweppes product. Given the premium-pricing power of Fever-tree it’s no surprise that other companies are trying to muscle in on this market. One of the surprise challengers in the market is the Lidl budget-supermarket. 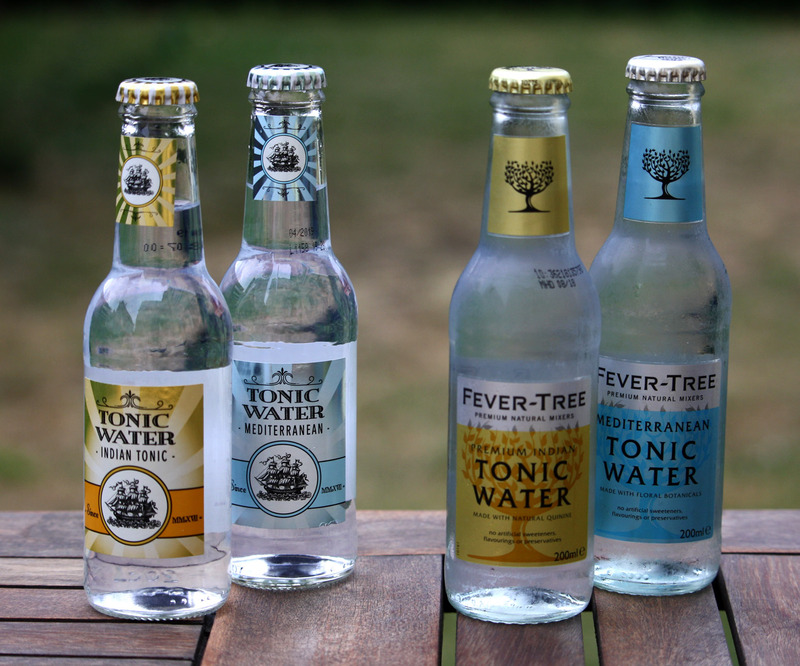 They have produced a range of tonic waters, including the classic Indian tonic and a Mediterranian tonic as well as a more left-field offering of Elderflower tonic. As a thrifty Yorkshireman I thought it was time to compare these tonic waters with the more expensive Fever-Tree branded one. As a comparison of the price difference a Fever-tree Indian tonic retails for €1.49 at the trustry Rewe supermarket. Compare this with the €1.69 price for four bottles of the Lidl tonic. So the question is which is the better tonic water ? Before we get ion to the tasting, here’s a little glamour shot of the Lidl product, looking visually similar to it’s more expensive brethren. Not the Lidl product has the wonderful branding “since MMXVII” – or 2017 to you and me. For the taste test I tried both tonics against their Fever-tree equivalent, both as a simple tonic water and in a G&T. The Gin was the trusty Hayman’s London Dry Gin, so something that’s not too cheap or too complicated in taste. First up for the challenge are the two Mediterranean tonic waters [mainly, dear reader , because I pulled the wrong bottles out of the fridge]. For these tonic waters you expect the tastes of the Mediterranean (duh!) so imagine yourself on a morning walk through the fields and orchards of Provence, the citrus smells of the lemon groves contrasting with the bitterness of crushed herbs. I tried both tonic waters pure and a little chilled. The Lidl product had more of a citrus twang, whilst the Fever-tree tonic was more bitter and herbal. Of the two I clearly preferred the Fever-tree. For the G&T test I mixed the tonic 3 parts to one with gin, a couple of ice cubes and a slice of lime. Here the results were a lot less clear. I preferred the bitterness of the Fever-tree, but the rest of the tasting panel (Mrs LearnaLittle and Miss LearnaLittle) were both sold on the refereshing summery taste of the Lidl-based G&T. Round 2, and Day 2, was the Indian Tonic waters. In the pure form the Lidl tonic, again, has a more citrus taste than the Fever-tree. For the G&T I again grabbed the the Hayman London Dry Gin added ice, a slice of lemon, and mixed at ratio of 1 part gin to 2 parts tonic. Defining which was better was a little more of a challenge and depends a lot on which gin you are working with. The Lidl gin obviously pushes out the citrus notes whereas the Fever-tree is bringing more of the bitter quinine taste to the drink. Being the thrifty soul that I am I was hoping to report that the Lidl tonic, which costs roughly a third of the price of the Fever-tree tonic was better value. The answer is not so simple, it’s a bit more horses for courses. If you have a strong-willed gin, such as the spicy Durham Gin then the Lidl product may balance it out. In addition if your enjoying your G&T on a budget I would recommend you forgo the please of a Fever-tree tonic and invest your money in a better quality gin. If someone else is buying you a Gin and Tonic it’s still worth insisting on a Fevertree tonic. Whichever you decide please do one think, just do yourself a favour and stay clear of a Schweppes Indian Tonic Water. 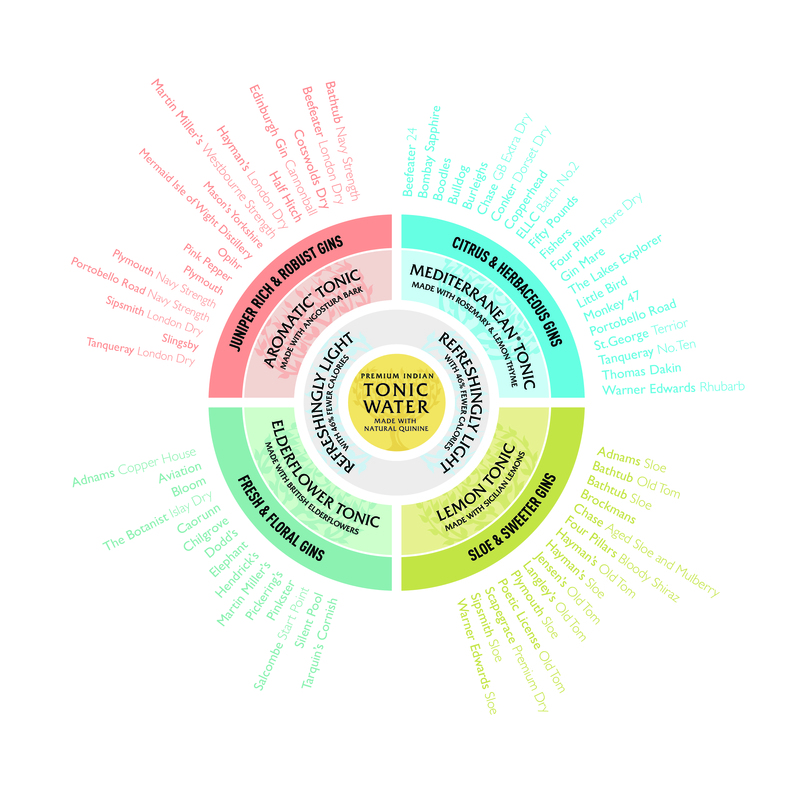 Shortly after I published this commentary I saw that Fevertree have now produced a rather useful pairing-wheel, that suggests which tonic water you should try with which gin. You can either use the version below, or go to the FeverTree website for the interactive version. Hopefully one day they will have an app that I can use to blag my way through gin tastings “Ah yes, Monkey 47 Gin. I would recommend [checks app] a Mediterranean Tonic Water that uses [check App again] essential oils from the flowers, fruits and herbs gathered from around the Mediterranean shores”. This entry was posted in Gin, Tonic Water and tagged fever-tree, fevertree, Gin, Gin and Tonic, indian tonic water, Lidl, tonic wasser, Tonic Water. Bookmark the permalink. Thanks. I’ve been trying and enjoying the FeverTree Aromatic Tonic Water recently. When I get hold of it I need to try the Lidl version.